Loose adaptation of Hans Christian Anderson's 'The Snow Queen'. I'll admit that when the teaser for Frozen first came out, I was appalled. It appeared that after the recent commercial and critical successes of Tangled and Wreck-It Ralph, Disney was testing our tolerance for the pedestrian and subsequent trailer releases did little to boost my confidence in the picture. I am pleased to say, however, that Frozen far exceeded my expectations, and proved itself worthy of the Disney name. It's not as funny as Winnie the Pooh or Wreck-It Ralph, and it doesn't capture the Disney Renaissance feel as well as The Princess & the Frog, but Frozen is one of the year's best animated films- especially notable in a year where good animated films have been rather scarce. Loosely based on Hans Christian Andersen's fairy tale The Snow Queen, Frozen is about two sisters (both princesses) named Anna (Bell) and Elsa (Menzel). Elsa, the elder of the two, has magical powers that allow her to create and manipulate ice and snow. Elsa has to keep this secret to herself, though, in order to protect her sister and the kingdom. But on the day of Elsa's coronation, her cover is blown, and she flees to a far away mountain and puts the entire kingdom in eternal winter. 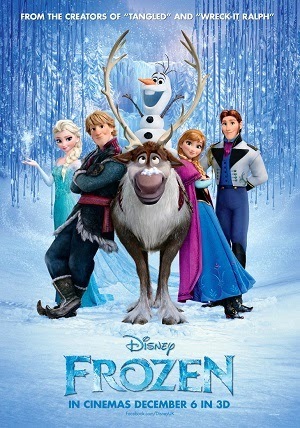 Anna is determined to speak with her sister and help her fix everything, so Anna begins a journey to her sister- but not without the help of an ice salesman named Kristoff (Groff), a reindeer named Sven, and a talking snowman named Olaf (Gad). 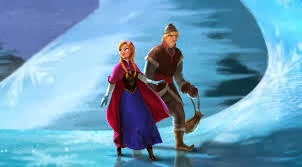 Frozen takes elements from Renaissance Disney (such as The Little Mermaid, Beauty and the Beast and The Lion King) but there is clearly more influence from modern Disney (such as Enchanted and Tangled). The Tangled influence is the most evident in this picture but, thankfully, many of the flaws evident in that feature are nonexistent or minimized in this one. The characters are definitely more modern Disney. In Renaissance Disney, the primary characters were somewhat bland, but very likable. Most of the humor came from the supporting characters. In more recent Disney films (specifically Tangled), the main characters can provide just as much humor as the supporting cast, and that much is true here. It's worth noting, however, that many of the characters are irritatingly similar to those in Tangled. For example, Anna is alarmingly similar to Rapunzel. Sven seems like a combination of Maximus and Pascel (and essentially serves the same purpose as both of these characters), and while I won't say that Kristoff completely goes the Flynn Rider route, there at least seems to be a little influence from this character. Despite this, these characters are still entertaining, and serve their purpose. The more notable characters, however, are Elsa and Olaf. The internal conflict in Elsa is done to perfection, and her character design is fantastic. Olaf - despite being pushed heavily in marketing- isn't in quite as much of the film as you would think, and (thankfully) he isn't nearly as obnoxious as one might think based on the trailers. On the contrary, he's very funny, and provides many of Frozen's biggest laughs. He's not as good as Genie from Aladdin, or even Mushu from Mulan, but he gets the job done. The Duke of Weselton (delightfully voiced by Alan Tudyk, who portrayed King Candy in last year's Wreck-It Ralph) is funny in the few scenes he's in, but his motivation as a (minor) villain is both underused and underdeveloped. There's also a very funny character named Oaken (Williams), who runs a trading post, who gets one very memorable scene. The songs also seem to take more of a page from modern Disney. Rather than producing big, Broadway-type numbers like the Renaissance Disney films were known for, the songs in Frozen have a very noticeable pop vibe, while retaining the orchestral score. This was notable in certain songs in Tangled and Enchanted, but they were never implemented this heavily. Also, rather than the Alan Menken / Glenn Slater collaboration that recent Disney musicals have had, the score is instead written by Christophe Beck with song lyrics by Kristen Anderson-Lopez and Robert Lopez (Book of Mormon, Winnie the Pooh). There are 10 songs in this film, but two are reprises, and one is under a minute and is really more of an afterthought. The opening number, "Frozen Heart" has a similar feel to "Virginian Company" from Pocahontas. It's a good song (and destined to be forgotten among the other numbers), but the melody and music is especially nice in this song. I'd personally be interested in an instrumental version of this song with a fiddle performing the melody in place of the vocals. "Do You Want to Build a Snowman?" is a heartbreaker. Don't let that innocent title fool you, this song was a tear-jerker. The lyrics aren't especially clever, nor do they flow especially well, but that's not the point of this particular song. Rather, it's to show the struggle Ana and Elsa have being separated, and this is accomplished perfectly through visuals and pitch-perfect singing performances. "For the First Time in Forever" is the most Tangled-esque song in the film with bouncy lyrics and predictably chipper attitude. But it won me over all the same (especially towards the end). "Love is an Open Door" is a catchy and comedic number that's sort of a parody of the absurdly brief pre-marriage relationships between Disney characters. Later parody and satire humor related to this is also successful. In fact, I would argue that the few bits of parody/satire type humor in this film is better than all related humor in the entirety of Disney's Enchanted. "In Summer" and "Fixer Upper" are good for throwaway comedy numbers, but the standout is "Let it Go." On one hand, the pop song vibe is a pinch distracting, but the orchestral score makes it work. The lyrics are excellent, the visuals here are gorgeous, and Menzel nails the singing. A reprise of this song performed by Demi Lovato plays during the credits, but it's vastly inferior to the original. Disney films are also known for their beautiful animation and Frozen is no exception. The environments are gorgeous, sometimes stunning, and some scenes involving snow falling are almost breath-taking. Admittedly, this film might have really benefited from traditional animation instead of CGI, but that doesn't make the visuals any less attractive. The cast is reasonably good. Bell and Menzel as Anna and Elsa respectively are without flaw, whilst Groff, as Kristoff, is good enough. Gad as Olaf is channeling a lot of Jonah Hill here, but the performance works, and it's never annoying. Christophe Beck has composed dozens of scores over the years, but none of this work has been especially memorable. 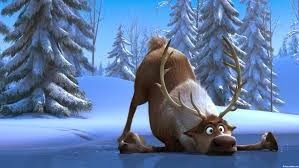 Frozen is an important milestone for him, however, as it's a reasonably good score, though his work is certainly outshined by the music in the lyrical numbers, which are composed by Kristen Anderson-Lopez and Robert Lopez. The first half hour of Frozen provides some of the biggest laughs of the film, and more importantly, the most touching moments. And while there are emotional highs and lots of humor throughout the rest of the film, nothing else in this film compares to the first half hour. The first 15 minutes especially are pure cinematic gold. But the rest of the film does more than enough to make itself a memorable animated film that you would do yourself a favor to check out while it's in theaters. It's not the best that modern Disney has to offer, but it's a fantastic throwback to the Disney Musical. Note: There is a Mickey Mouse short film preceding the film entitled Get a Horse! It's both technically interesting, nostalgically pleasing and genuinely funny. It's fun, it's inventive and worth arriving early for.